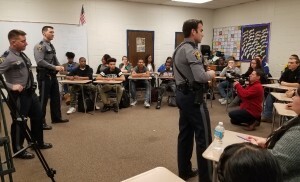 In an effort to connect with high school students and teach them about the dangers of opiates, the Manchester Township Police Department created a comprehensive drug awareness program for 12th grade students, the first of its kind in the State of New Jersey. The program, called #NotEvenOnce, touches on a common theme Officers often hear when they speak with a person addicted to opiates — if they hadn’t of tried opiates even once, they never would have become addicted and encountered the numerous health, legal, and social issues that are associated with opiate addiction. “The opiate addiction problem in Ocean County has reached an epidemic level and we cannot pretend that this issue will go away. We must be proactive, and reaching high school students is an excellent start,” said Chief Lisa Parker. She recognized an opportunity for a police-based opiate awareness program at the high school level. Our primary focus is to educate students about the dangers of abusing opiates such as prescription medications and heroin and then help them make informed decisions. This past summer four Officers: School Resource Officer Chris Cerullo, Detective Adam Emmons, Ptl. Joseph Fastige and Ptl. Keith Craig, were tasked with developing the high school opiate awareness program with the guidance of local teachers, administrators, recovery coaches, and the Manchester Township Municipal Alliance. Since the Officers were unfamiliar with the development of State-approved school curriculum, Mrs. Dana Cerullo and Mrs. Melissa Nazario, local teachers who are married to Manchester Police Officers, volunteered their time during the summer break to write the curriculum. On day two, students are introduced to the Recovery Coach, a former addict who is now a trained professional who assists others in recovery. Students are invited to participate in an interactive discussion, asking questions, while listening to the recovery coach talk about their personal journey and what it’s like to be an addict. 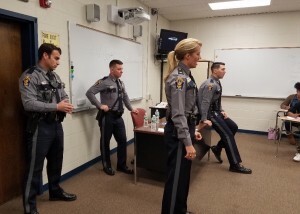 On day three, Students then are shown a video interview conducted at the Ocean County Jail by Manchester Police Officers featuring a former Manchester Township High School graduate who was incarcerated for drug use. His story is that of a normal student who suffered a high school sports injury that led to a prescription pill habit, subsequent heroin addiction, and finally incarceration. This is a real life, candid jail house conversation exemplifying that this problem can affect anyone. Additionally, the Officers teaching the program share their own experiences, including what they have seen while responding to calls and how addiction has impacted their own families. At the conclusion of the first three instructional sessions, students provided valuable feedback. Many were surprised by the amount of drug activity in their own neighborhoods, and they appreciated how the Officers spoke personally and candidly. Officers worked closely with education officials to ensure that the program meets all State curriculum standards and can further the goals and objectives of a successful drug awareness opiate program. Both Chief Parker and Superintendent Trethaway believe this program could benefit students state-wide. 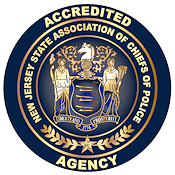 Presentations will be made to the Ocean County Superintendent and the New Jersey Association of Chiefs of Police in an effort to expand its reach and help as many young adults as possible. 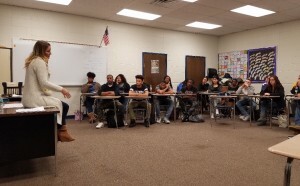 “I would like to express my appreciation to Chief Parker and the Manchester Police Department for reaching out to our students and definitely making a strong statement about the dangers and seriousness of drug abuse. This is a tremendous benefit to our students,” Superintendent Trethaway said. While the goal of #NotEvenOnce is to bolster the prevention aspect of curtailing drug abuse, another facet in the effort — increased enforcement — has been underway since the July 2014 formation of the Narcotics Enforcement Team. Since its inception, this specialize unit has made 370 drug arrests, executed 21 search warrants, and seized $39,000 in cash and 32 vehicles.